Getting Rcbot2 to work with Black Mesa? I've recently compiled Botrix for BMS using alliedmodders sdk. It works fine but the bots themselves are very dumb and the waypointing system is atrocious. I'm going to try and compile rcbot for bms using the same method. Is there anything I need to change code-wise or the same trick should also work? I have metamod and sourcemod installed. I've taken a quick look, why are there 2 projects? I couldn't get the HPB_Bot2 to compile as it complains about the actual code (around 170 errors). After a bit of tinkering I've compiled HPB_Bot2 in Meta folder and I get RCBot2MetaDebug.dll. This doesn't sound right. Shouldn't it called something like rcbot2_meta.dll? Quickly tried it out in BMS, doesn't even recognize it. I admire your ambition and hope for testing RCBot2 for Black Mesa DM. Besides I was wondering on allowing support for that GameMod. But you will need to have the weapon entities along with their fire rate, delay as well for other things for bots to understand as they don't know human language except in C/C++. Besides you don't want bots to use Bazookas in close ranges as well not knowing how to toggle laser to steer the rocket, do ya? This maybe not to hard as we could extract some HL2DM weapon data as they have some similarities. That's not a huge deal as most of the weapon entities are almost 1:1 from HL2DM. I just can't get it to work on BM engine at all, game instantly crashes when I load the dll through the vdf. Did you get the crash dumps or any developer/debug logs for us to have a look at? 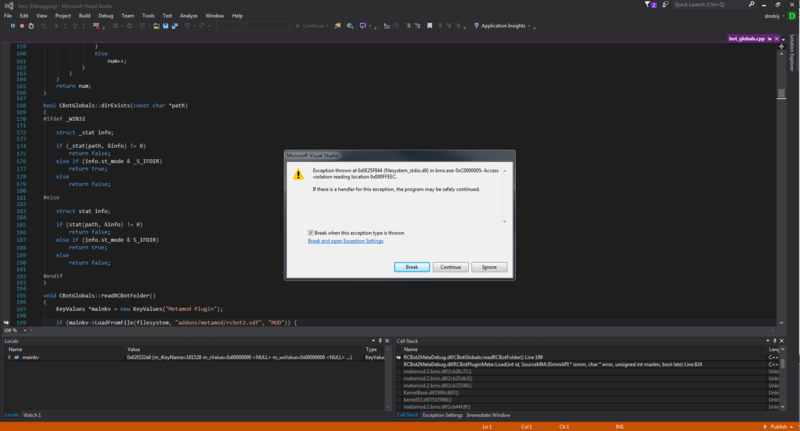 If you've managed to compile with VS 2013 you should be able to attach hl.exe to its debugger and it should break when it crashes. Hmm, I suppose it complains about the .vdf? I dunno if this is any help to you guys. Are you compiling with VS2013 tools? 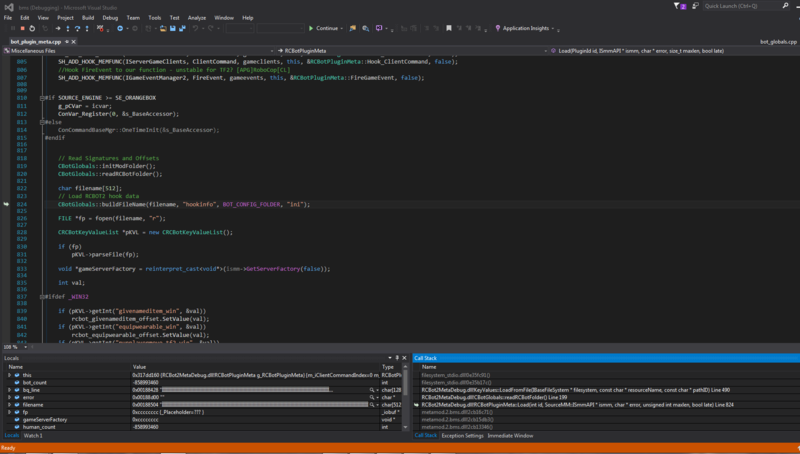 As far as I know the HL2 engine is not compatible with VS2015+ compile tools. looks like maybe it can't fine the files, don't know why it would be crashing though (apart from the VS tools thing)... did you check where exactly it is looking for the files by putting a watch on the variables? No as far as I know it's vanilla VS2015 setup. 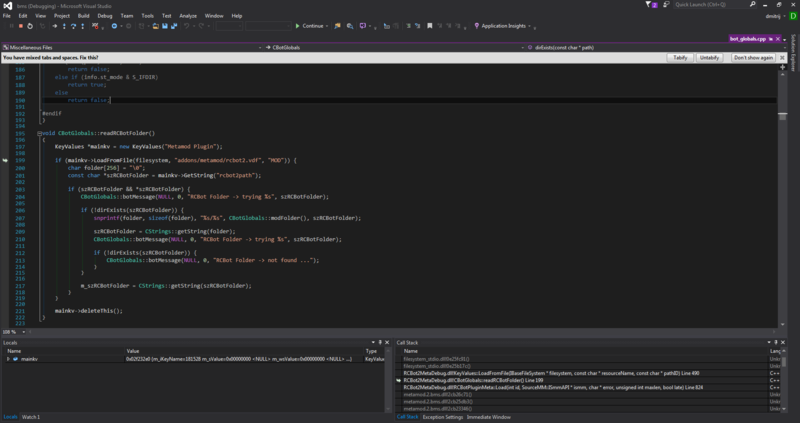 The only thing I did change in the project is use alliedmodders sdk libraries in project settings. I changed to use the libs from the Rcbot2 source and it's still crashing instantly. This doesn't look right to me? Where is it taking this from? I don't even have this folder.